When the days get lighter the outside world starts calling. Whether you are interested in camping, hiking, or simply enjoying the sunshine you will want to be outside making the most of it. This is the time of year when children and families play games in the garden or in any green space. Amongst these games you will have the classic rounders, cricket, or even badminton. 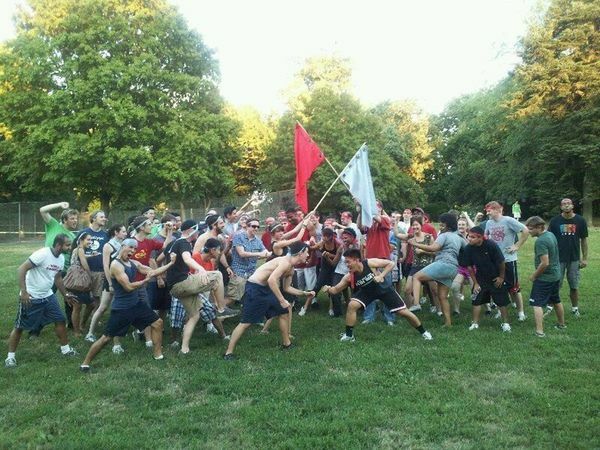 However, a more classic game, that is often overlooked, is the capture the flag game. You can find the details of this game on this  site - capture the flag game. This is a group game; you will need two teams of people. These teams can be as small as two people or as large as you like. Both teams have a base and a flag in their base. The flag can be an actual flag or something that represents the flag. You will have a choice whether to place the flag in your base or to hide it somewhere. Next it is necessary to decide where the terrority is and where the jail is for each team. The game can then start! As the title suggests, the aim of the capture the flag game is to capture the flag the other team has. This is, in fact, your flag! Whilst you are in your terrority you are safe. However, as soon as you cross into the other team’s area you are at risk of being captured! You will need to confirm before you start the game what is required to be captured. It may be as simple as a touch on your shoulder or you may need to be restrained. This decision will depend upon the age of the people playing. The aim is to sneak through the other area until you find the flag. You then need to get it back to your own base without getting caught. The first team to successfully achieve this wins the game. Anyone who is caught during the game must be put in the jail space. One team member will need to guard them and you lay even define rules as to how these people can either escape or be freed. One of the best things about the capture the flag game is the fact that you can play it almost anywhere and all you need is two items to act as flags! This game can be excellent fun at birthday parties, youth nights, summer camps or even just a family gathering. To make the game even more interesting and to enable play during the colder months or at night, it is now possible to purchase glow in the dark flags. These will make it easier to see the flags in the dark and change the tactics of the game. A glow in the dart flag cannot easily be hidden; finding it will be easier but getting it back to your own base much harder. The capture the flag game may be an old one but this new twist adds an extra dimension and keeps it relevant for anyone who wants to have a bit of fun.